IWM outperforms SPY over the sample period. 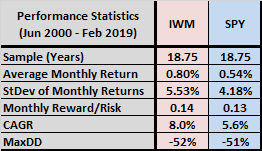 IWM outperformance concentrates during the first four years of the sample period (collapse of, and initial recovery from, the 1990s technology bubble). 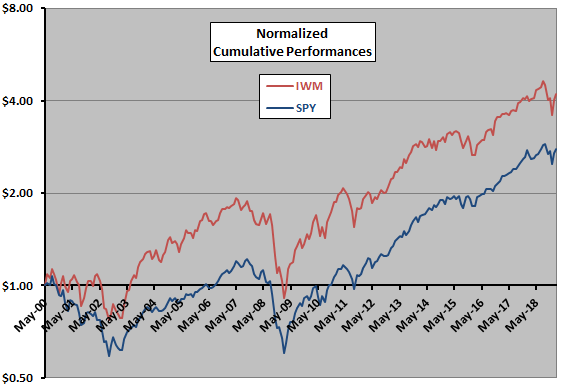 For additional insight, we compare IWM and SPY performance statistics. 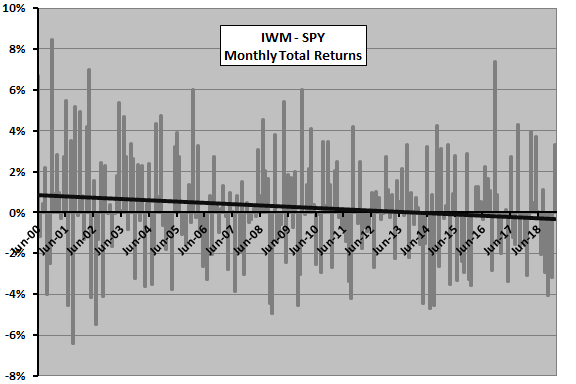 IWM has a higher average monthly return than SPY, but also a higher monthly return volatility. Monthly reward/risk for IWM (SPY) is 0.14 (0.13). Per the above chart, IWM has a materially higher CAGR than SPY. However, since March 2004 (almost 15 years), CAGR for IWM (SPY) is 8.2% (8.4%). The 2000-2003 collapse of large technology stocks is decisive for IWM outperformance over the available sample period. MaxDDs of IWM and SPY are close, undermining an argument that IWM outperformance is compensation for high crash risk. For (linear) trend analysis, we plot the monthly IWM-minus-SPY returns. The next chart plots IWM-minus-SPY (IWM – SPY) monthly total returns over the available sample period. Consistent with findings above, a best-fit trend line suggests that the size effect disappears (and reverses) during the sample period. However, the sample period is short in terms of economic/equity market cycles. For another perspective, we zoom out to annual returns. 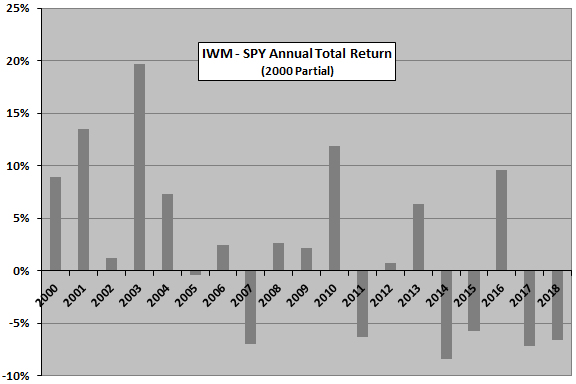 The next chart summarizes IWM – SPY total return by calendar year, showing that annual results vary considerably over the sample period and confirming that early years drive IWM overall outperformance. Does the size effect differ by calendar month? 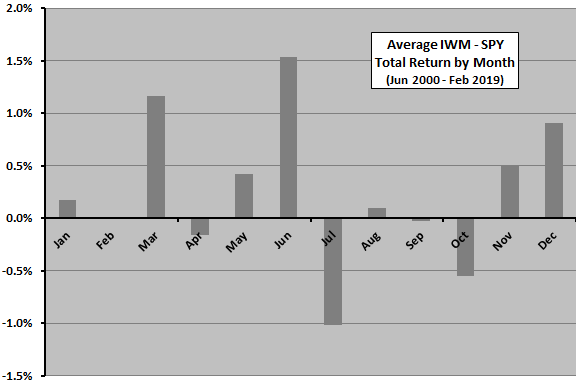 The final chart shows average monthly IWM – SPY total return by calendar month over the available sample period. Results suggest that March, June and December exhibit positive size effects and July a negative effect. With only 18-19 observations per calendar month, the sample is very short for this kind of analysis. In summary, evidence from simple tests of capitalization-based ETFs with nearly 19 years of data offers little support for belief in a long-term, reliably exploitable size effect among U.S. stocks. The criteria for constructing/rebalancing the ETFs may not efficiently exploit a size effect. As noted, the sample period is short for reliable measurement of a size effect that varies with some long economic/equity market cycle or by calendar month.